The following is a guest article by journalist Alexander Fanta, reposted with kind permission of Netzpolitik.org. The original stories in English and German, along with their data, are posted here and here. Facebook, Twitter, Amazon and Google – many tech companies are involved in journalism. A major force, however, is Google’s News Initiative. But where does Google’s money go? We can reveal that the typical recipient of Google funding is a commercial legacy institution in Western Europe. Meanwhile, non-profit news organisations and public-service media rarely receive funding. The only question is: what is Google trying to achieve with its sponsorship? ‘Werewolf’ is a typical party game. In the beginning, two of the players are chosen as the ‘beasts’. The task for the other participants, the ‘villagers’, is simple: Collaborate to identify the werewolves and throw them out of the game. A gamemaster – a figure removed from the tides and turns of the game – oversees and guides the activity. The game, known to some as Mafia, is also the favourite of Richard Gingras, Head of News at Google. Gingras likes to play it with the very people who used to be Google’s harshest critics: the heavyweights of the media industry. Every year, Google hosts a summit called Newsgeist. Last year it took place in Copenhagen, this year in June it was in Lisbon. At the meeting, leading figures from the world of European journalism and publishing get together. This year’s list of guests included big names such as Wikipedia founder Jimmy Wales as well as editor-in-chiefs and media managers from all over Europe. During the day, Newsgeist’s guests debate questions like ‘What could Google do for news?’ In the evening, it’s whiskey and werewolf. Gingras prefers the role of gamemaster. You can’t throw him out of the game and he keeps absolute control. It’s very much the role Google likes to play in journalism, too. Over the past few years, Google has been pushing deeper and deeper into an area essential to the functioning of democracy – the world of journalism. It’s a move that has had lasting effects. Google’s strategy is not just about rivalling publishers in the hunt for advertising revenue. More and more traffic to publishers comes from Google Search and Google News. If people want to watch news, they often look for it on YouTube. News sites use Google Analytics to count visitors and store their content on Google servers via mobile-optimised AMP pages. If you want to pay for media, you can now do so with ‘Subscribe with Google’. Over time, Google has built an ecosystem that no publisher can ignore. One could call it an ‘operating system’ for journalism. Yet, beyond its immediate business interests, Google also runs a 150-million-euro programme to promote innovation in journalism. The Digital News Initiative (DNI) was launched in 2015, at a time when many publishers in Europe were fiercely criticising Google as disruptor of journalism’s business model. 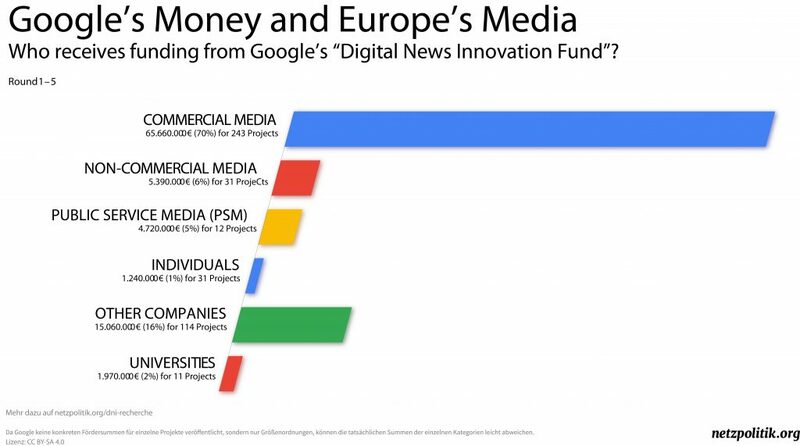 Google’s Digital News Initiative has given 115 million euro to journalism-related projects over the past three years. A data analysis conducted by netzpolitik.org has looked at 447 projects that the DNI fund supported in its first four rounds. Our data, which is based on a project registry which we scraped from the DNI website and then coupled with additional reporting, sheds light on who Google gives money to – and what kind of projects are funded by the Internet giant. Since its founding in 1998, Google has grown to become one of the world’s most valuable firms. The market capitalisation of Google’s parent company, Alphabet, is above 800 billion US dollars. It could soon follow Apple and Amazon in breaking the trillion-dollar barrier. At the moment, Google’s main source of income is still online advertising. But the company also offers services in web solutions, in biotech or cyber security – there is little more Google can’t do. Google, A Saintly Patron Of Journalism? It is estimated that together, Facebook and Google draw around 85% of total digital ad revenue worldwide. Many publishers have suffered greatly from this duopoly; the dominance of the two companies has put great pressure on entire business model of journalism. And yet, today, Google is the internet platform most respected amongst publishers, while Facebook is often criticised. How did Google become so popular among publishers? The answer could be money. Google appears to have turned itself into a Renaissance-style patron of journalism. It is rare that a private company hands out so much cash to other private companies, with apparently so few conditions. We found that a large part of Google’s money goes to the media establishment. 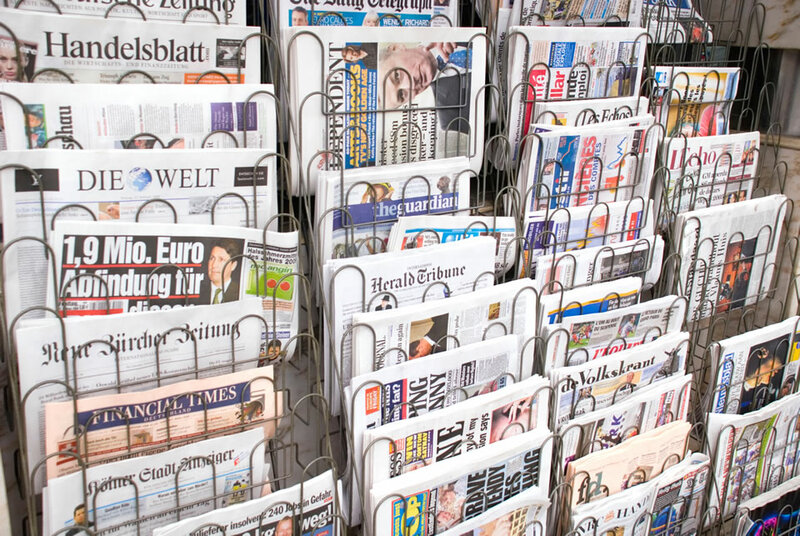 54% of the funding in Europe went to long-standing commercial publishing houses, including projects at Trinity Mirror, the Telegraph Media Group and Thomson Reuters in the UK. None of the three companies replied to our query about the amount of money received from the Google Fund and, so far, haven’t publicly disclosed this information. More than half of recipient organisations were founded in 1997 or before. Most (83%) are based in Western Europe. The typical recipient of Google funding is a legacy institution, Western European and for-profit. Comparatively, the DNI Fund is much less generous to non-commercial journalism. Only 10% of projects in our data set went to non-profit or public-service media. Where does Google’s money go? Explore our data with the interactive graphic below (which is also available here). By clicking on one of the fields you can dig into out data and find additional information about the media outlets and organisations funded by Google in the respective countries. By clicking on an organisation you can reveal additional information about the funded projects. Return by clicking “Google DNI” in the top left corner. Google’s News Initiative has done much to help publishers in their drive for innovation, according to Veit Dengler, CEO of NZZ media group in Switzerland, now an executive at Bauer Medien in Germany. Dengler chairs the DNI Fund Council, whose members decide who receives funding for large projects. Of the ten members of the council currently listed on the website, three work for Google. The rest comes from academia or the world of publishing. At a meeting in Hamburg at the end of August, Dengler said that the Digital News Initiative was also a PR instrument for Google to win over the European publishing industry. Some DNI applicants such as the Telegraph or the NZZ are familiar faces to the advisory board – a side effect of a publishing world becoming increasingly networked, thanks to Google-funded events such as the International Journalism Festival. We found that a large part of Google’s money goes to the media establishment. Dengler further said that funding decisions are often affected by who applies. According to him, decisions about projects take into account how innovative the projects are for their market as well as how innovative they are within the company applying. In effect, this means that established publishers play by a different set of rules. Many media organisations we contacted did not wish to disclose how much money they receive from Google. DNI provides only a broad bandwidth of funding sizes, such as 50,000 to 300,000 euro for medium-sized projects. We were able to find out exact funding sums for fewer than half (217) of 447 projects. Not all of Google’s money goes to news media. A quarter of the funding is handed to non-publishing organisations, including start-ups that develop services for the industry. For example, 50,000 euro went to Trint, a company that develops speech-to-text transcription. What Counts As Innovation In The Google Universe? Our data helps to shine a light on what ‘innovation’ means in the world of Google. Four in ten projects funded by the DNI deal with automation and data journalism. For example, Google money helped a joint project between the Press Association, a UK news agency, and the media start-up Urbs Media with 706,000 euro to start a project on automation in local news. The publishing industry, which has been relatively slow to innovate, also uses Google’s funding to develop new audiovisual formats and platforms. A fifth of the DNI projects in our survey are aimed at new forms of presentation of content, including virtual reality. Project descriptions often teem with industry buzzwords. 8% of the projects are dedicated to fact-checking and credibility according to our data, 12% are geared towards community building and crowdsourcing. Project descriptions in this area frequently mention the terms blockchain, fake news, or hate speech, echoing favourite buzzwords at journalism conventions over the past years. Google’s money comes, however, with one major condition; it does not fund content per se, but rather projects that ’show innovation’. In recent rounds, the DNI Fund required applicants to demonstrate how their project creates ‘economic value added for the business’. In other words, the fund pushes certain business models. Of the projects we looked at, 5% are primarily aimed at attracting online advertising, while 11% are geared at developing non-advertising sources of revenue such as paywalls. At first glance, projects often seem to compete with Google products, whereas in reality they mostly complement Google’s existing online ecosystem. The DNI project database reveals certain hidden benefits for Google from the DNI. Several of the projects are based on Google services. An Austrian developer, for example, received prototype funding to develop VoiceAd, an app that lets users create their own audio ads with Google Text to Speech and Google AdWords API. Other projects use Google Fusion Tables, are built on Google News, Trends and Analytics or make use of Youtube data. By spreading its services, Google strengthens their dominance in the publishing industry. The role of news media in this data collection was recently highlighted in a study conducted by Douglas C. Schmidt at Vanderbilt University. The researchers compared data streams from mobile phones built on Google’s Android OS with those from Apple iPhones. They showed that users send data to Google, even if they don’t use any Google products or visit Google webpages. ‘This communication is driven purely by advertiser/publisher services’, Schmidt notes. Media sites help Google track even the most elusive users on the web. An innovation project little known outside the publishing industry provides a clue as to how DNI links to Google’s business interests. Google launched Accelerated Mobile Pages (AMP), as open source standard shortly after starting the DNI in 2015. While media companies can host their own AMP content, many choose to store it on Google’s servers. AMP has recently provided a big traffic boost to news sites, figures by analytics company Chartbeat show. However, AMP has also stoked industry fears of an even stronger dependence on Google infrastructure. The Google fund supports several AMP-based projects. Among these is Poool, a French start-up building an AMP-optimised paywall. In theory, this makes Poool, which received 50,000 euro from DNI, a competitor to ‘Subscribe with Google’. In practice, it chose a niche spot which a corporation like Google could take at any time if it wanted, as Poool founder Maxime Moné admitted in a telephone conversation in July. ‘If Google wants to take it, they will take it,’ Moné said. Projects funded by Google agree to certain milestones and must update the DNI Fund about their progress. This allows Google to gain insight into the product ideas of potential competitors, all for the price of a few thousand euros in funding. The terms and conditions on the DNI’s website state that Google ‘may independently create, develop or purchase products, services, information or materials, or work on, sponsor or commission projects, related to, or similar to, the subject matter of your application’. If a brilliant project were to come out of the DNI, Google could be tempted to develop an equivalent product, but much quicker and better. 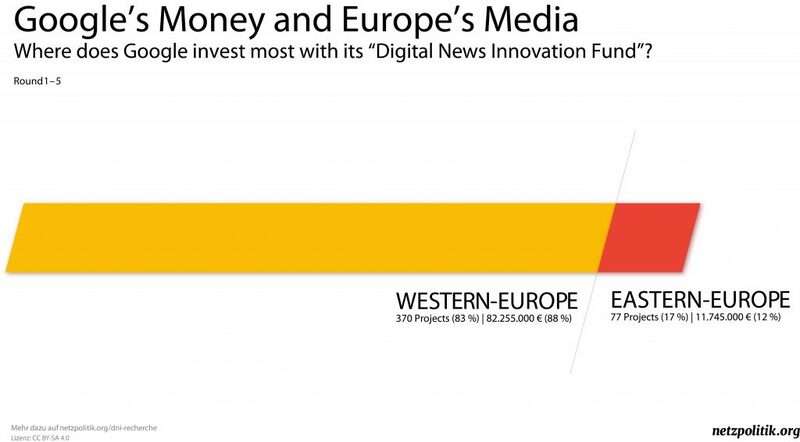 Google’s Director of Strategic Relations, News & Publishers, Madhav Chinnappa says that the DNI Fund is ‘specifically not connected with Google products and purely attempts to stimulate innovation in the digital news ecosystem in Europe’. According to quotes by Chinnappa emailed to netzpolitik.org by a spokesperson, Google has never developed their own version of a product based on a DNI-funded project. Meanwhile, Google has no qualms about spelling out its interests to publishers. Ahead of a vote on copyright reform in the European Parliament in June, Chinnappa warned publishers against the proposals. In an email to the ‘DNI Working Group’, first reported by the FT, Chinnappa wrote that plans for an EU-wide ancillary copyright law based on the German model were ‘bad for the news ecosystem’; the obligation to filter content ‘bad for the Internet’. The email ends with a suggestion to contact politicians in Brussels. Chinnappa’s message demonstrates Google’s willingness to use the Digital News Initiative on behalf of its own financial interests. It it not likely it changed a lot of minds; many publishers are vehemently in favour of an ancillary copyright. And yet, by emailing frank policy suggestions, the company reminded the publishing industry of its stake in such decision-making. But how could Google, for many years seen as enemy by publishers around the world, become their partner? A few years ago, politicians in Europe debated ‘Google taxes’ and special taxation to finance journalism. That approach, however, faltered amid Google’s resistance: the ancillary copyright law introduced in Germany in 2013 became a triumph for Google instead of costing them money. In Spain, which introduced a tax on linking to publishing services in 2014, Google News simply withdrew. The publishing industry stayed angry with Google. The Financial Times summed up the situation in 2015: ‘Google needs more friends in Europe’. But Google learned its lesson, it learned to give. After a political debate on the introduction of a ‘Google tax’ on advertising revenues, Google promised the French publishing industry a 60 million euro fund for ‘digital innovation’ in 2013 – thus creating the model for the Digital News Initiative. 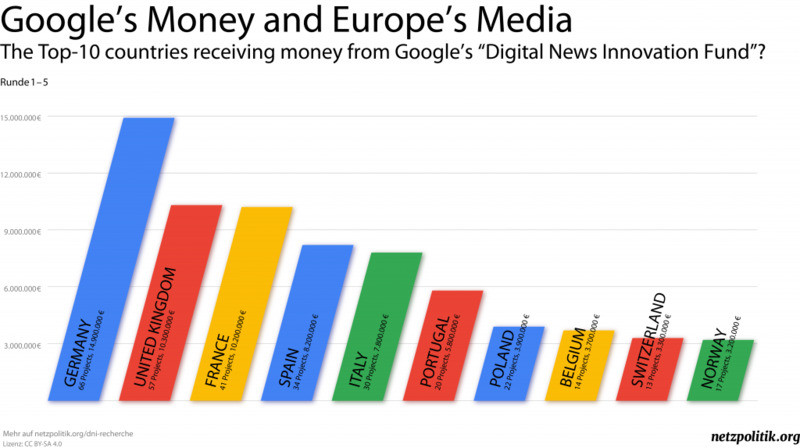 Google’s funding also goes to journalism institutions all over Europe. The Reuters Institute for the Study of Journalism (which is a partner of the EJO’s English site) received a grant of 5,278,000 pounds from Google for its annual Digital News Report and related projects for the period from August 2015 to December 2018. The Institute has recently been promised more funding. 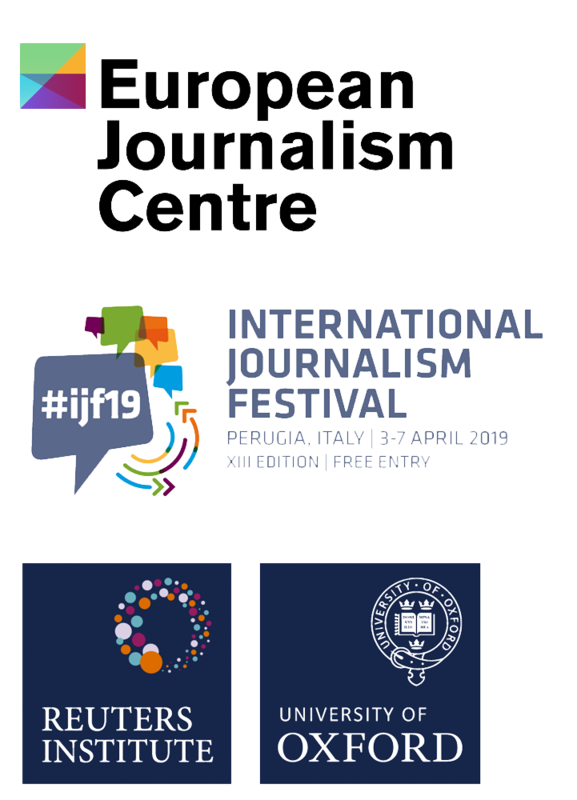 Meanwhile, Google (together with Facebook) is also a major sponsor of the International Journalism Festival in Perugia, one of the largest conventions of its kind in Europe. Furthermore, Google pays for training projects and handbooks at the European Journalism Centre in Maastricht. Both have not publicly disclosed how much funding they receive from Google. All three institutions stress that the internet giant does not in any way influence their work. There is no clear answer as to what Google wants to achieve with its millions of sponsorship. Only one thing is fairly certain: Google’s business interests in the media sector are growing. So what does Google want? We can learn from the American political scientist Joseph Nye in this regard. His concept of ‘soft power’ referred to the ability to shape the preferences of others through appeal and attraction – and helps us to understand Google’s efforts. The funding Google gives to media institutions and publishers bring it such soft power. It also helps Google to safeguard its long-term interests. Increasingly, the company is shifting from being a mere search engine to becoming a central node for the production and distribution of news. Its role will soon be indispensable for the news industry. Already, Google appears to have become mightier than any press baron of old. So far, Google takes great care not to be seen as political player. The company has not, at least in obvious ways, used its power over journalism to influence democracy. The questions is: What if it ever changed its mind?